With heightened volatility, uncertainty, and risk now part of the normal course of business, supply chain planning professionals need the ability to quickly tap into data to create a complete view of their supply, demand, and inventory, ensuring supply chain plans align with business objectives. They also need the agility to manage supply chain complexity and multiple scenarios more efficiently. 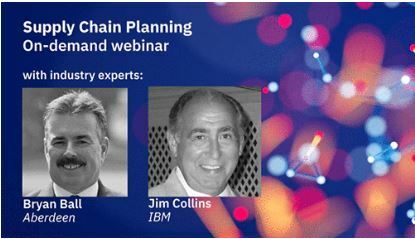 In this webinar, you will hear supply chain expert Bryan Ball and IBM executive Jim Collins explain the challenges supply chain organizations are facing today, and how leading organizations are driving business success through leaner S&OP processes, inventory optimization, material management, waste reduction, and better planning tools.